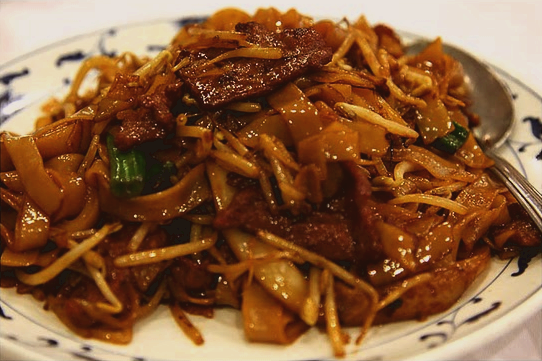 Singapore fried Kway Teow with Beef. A good dish taken for dinner! Slice beef thinly against the grain. Mix the beef with all the seasoning ingredients except the sesame oil and canola oil. Leave the beef to marinate for 20 minutes; then add the sesame and canola oil. Heat 1 1/2 tablespoons of oil in a wok, stir fry the chives and bean sprouts till they are slightly limp. Set them aside. Heat 1 tablespoon of oil in a wok, fry the garlic till crispy and golden. Add rice noodles and stir fry for about 4 minutes till lightly browned. Heat remaining oil in wok, add beef, remaining marinade and ginger slices. Stir fry beef till colour changes. Add rice noodles and bean sprouts, stir fry till everything is well coated. excellent tips. im a fan for yummy food. gotta try this one….thanks! This was pretty good. All of my family enjoyed it. tx. OMG!~ This recipe so shiok.. My family likes it.. since I am a muslim, i change the wine to vinegar and it taste awesome..